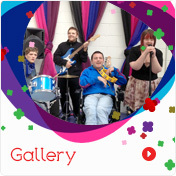 Making Waves is a registered charity whose principal aim is to raise funds and provide support to people in West Yorkshire with learning difficulties who use the Waves Day Care Centre in Slaithwaite http://www.wavesgroup.co.uk. Donations from individuals and businesses. Fund raising activities organised by the staff and volunteers at Waves, and by others. We also have a longer term aim to build and staff bespoke accommodation in Slaithwaite to help people with learning difficulties live independently. We are a Charitable Incorporated Organisation regulated by the Charity Commission and send an annual report of our activities and finances to the Charity Commission. Our annual reports and accounts are available for inspection. If you have a funding idea or are organising a collection we have branded buckets, tea shirts and publicity boards all bearing our logo that you can borrow - if you promise to return them to us for others to use after you. If you are a person with learning difficulties, or a carer for such a person, you can apply for help by filling in a simple application and handing it to Christine Fensom at Waves or by emailing it to us at: [email protected]. "Waves has been a life saver for Lewis, the fact that they are proactive in finding work placements for the individual is fantastic." "If it wasn’t for Waves I would be stuck at home. I love it!" "They take us to some nice places, I enjoy coming to Waves!" "Waves is fantastic! 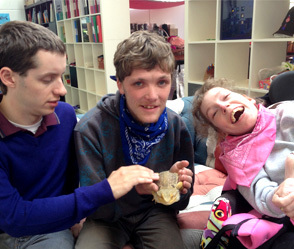 Ryan had fish for the first time at Waves, so we can go to the chippy now for fish and chips." "I like having my nails done with my tokens"
"Coming to Waves has made me less lazy and I’m encouraged to try new things." "I like to help clean the animals and I like going out."